Three Years Later: Serving people with disabilities is not optional; it is part of the package of rebuilding Yushu in 2013. Plateau Perspectives continues to work with the Disabilities Association to help develop and improve rehabilitation service provision. Over the next year, 80 staff workers will be assisted through a training program concerned with disabilities and rehabilitation. Plateau Perspectives’ on-going, longer-term response to the earthquake has been in two main areas: (1) post-earthquake livelihood recovery, through development of Community Ecotourism; and (2) development of Rehabilitation Services in Yushu Tibetan Autonomous Prefecture in cooperation with the Disabilities Association. Newsletter and annual reports, providing more detail about this work, can be downloaded from Plateau Perspectives’ website. Additional insights into our work can also be found in the “What We Do” section of Plateau Perspectives’ website; different sub-sections of our relaunched site also outline interventions in Income Generation, Community Ecotourism, Health & Rehabilitation, Disaster Relief, etc. In support of the development of Community Ecotourism, a new site with a focus on community projects has been launched in the past year, QinghaiEcotourism.org. Financial support for this work comes in large part from the Norwegian Agency for Development Cooperation (NORAD) by way of partner organizations in Norway, with additional support from Ford Foundation for the trial development of herders’ cooperatives and trust funds. Collaboration with nature reserve authorities also continues, as large areas of the prefecture are situated within ‘protected areas’ – and the development of a community co-management approach to conservation can help local communities better participate in conservation initiatives as well as achieve socio-economic development aspirations through community ecotourism and other means. Our project to support the development of Rehabilitation Services in Yushu Tibetan Autonomous Prefecture – begun in Longbao/Rongbo and also in Zhiduo/Dritoe – still needs further financial support. Please consider supporting our work, in aid of the people of Yushu. Donated funds will be used to support the development of Rehabilitation Services in the Yushu area, or as requested (e.g., to support community development, or other affiliated programmes). Thank you for your generosity! (3) We also support the recovery of local livelihoods in the area, with a special emphasis on building the capacity of local communities to participate in new tourism opportunities in the prefecture (note: the government has designated the Yushu area as a new tourism destination, and is rebuilding the regional economy accordingly). Specifically, since our last update, we have distributed the following emergency relief supplies in Yushu: more than 50 medium-size tents (each for 6-8 people), 700 solar powered dLights, 50 other solar powered lights, 5 large boxes of FedEx clothing, 400 thermals for children, 100 pressure cookers, 400 pairs of socks for children, 100 cell phone rechargers; 150 wheelchairs and 50 crutches; winter coats, shoes, hats, gloves, and thermals for 1,521 school children (with assistance from several local partners). This week, we also are preparing further relief assistance, including winter coats, hats, thermals, and blankets for an additional 420 school children; winter coats, shoes, and blankets for 1,000 people (with the Civil Affairs Bureau); 100 solar powered lights, 50 wheelchairs, and 20 crutches (with the Disabilities Association). Project agreements are in place for us to continue the above work in the months ahead. We are now working in cooperation with the Disabilities Association, and we are also in dialogue with the Tourism Bureau to promote more community-oriented tourism in the future. At the same time, with support from the prefecture government, we will of course also continue to respond to relief needs as we learn of them, especially now as people must face their first post-earthquake winter. The times ahead are still difficult, and your help is still very much appreciated. Thank you in advance for your continued support, in aid of the people of Yushu. The Yushu Prefecture government has requested aid from Plateau Perspectives in the form of medical personnel and medical supplies. We have established a base of operations for medical outreach, three medical teams are on site, and we are now seeing hundreds of patients each day in the devastated town. Additional supplies are en route. There is a solid network of medical personnel in China prepared to depart for Yushu, most medical supplies currently required are available domestically, and gifts of cash are the easiest and quickest way that you can help out. All donations are tax deductible in the USA and Canada; and in the UK, Plateau Perspectives will receive an additional 28% support from the government. US-Based donations go through Alpha Communities International, a partner of Plateau Perspectives which helps provide online donation support. For more information on Alpha Communities, please visit their website. To raise awareness for the needs that exist in these areas and the efforts of Plateau Perspectives and Yushu Earthquake Relief, please consider changing your FACEBOOK picture or your TWITTER profile picture to one of the images below. Plateau Perspectives and Yushu Earthquake Relief have been fortunate to receive valuable corporate funding and sponsorship from the following corporations as well as significant personal giving through PayPal. Plateau Perspectives responded to the request from prefecture government to assist in the relief work since 14 April 2010. In carrying out its work so far, PP has liaised with the prefecture Foreign Affairs, Health Bureau and Public Security Bureau, and also the provincial Public Security Bureau. Our emergency response has been profiled in national and international media, including BBC, CNN, CBC, Time Magazine and Global Times. The Global Times article can be viewed at http://china.globaltimes.cn/society/2010-06/537192.html. 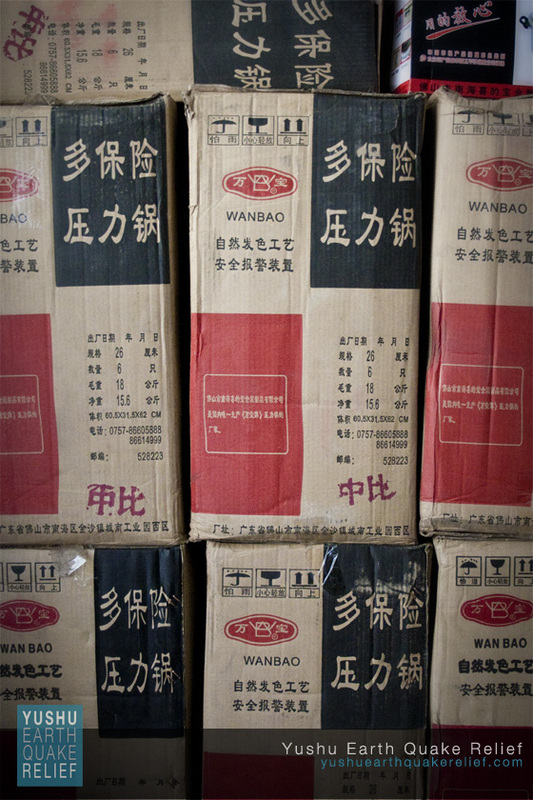 In Xining, nearly 300 patients under the care of several provincial hospitals received care packages, with items ranging from toothbrushes to new clothing, with the help of many volunteers in town. 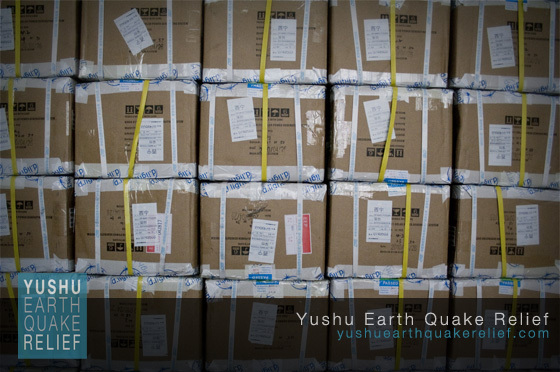 Relief supplies have been purchased and distributed in Yushu, including items such as large tents, beds, cooking utensils, solar powered electric lighting and thermals (clothing). Such household supplies can greatly enhance people?s living conditions in the new relocation camps. Additional donations of good quality used clothes have also been received from FedEx and now await distribution. Potable water is a necessary commodity, especially in relocated communities. Assistance was given in the start-up phase for a national project to expand water services in Yushu town, and now additional plans are under review to trial and demonstrate a low-tech (appropriate technology) system developed following the Sichuan earthquake. It is unclear, though, how much local communities recognize a need for supplementary purification, such that the future of this venture remains uncertain. A child and adolescent psychiatrist who runs an inpatient adolescent ward in the United Kingdom and whose daily work consists of speaking to traumatised children, will present workshops in Xining on 8-16 June 2010. Topics will include communicating with children, children who are distressed or upset, bereaved children, and also guidance on different approaches that are helpful and approaches that may be harmful when working with (i.e., supporting, counselling) traumatised people, especially children. Over the past few years, Plateau Perspectives has also been working closely with local pastoral communities to help improve their quality of life, with a special focus on increasing economic opportunities; and amongst the options available is the development of appropriate tourism. Discussions are therefore already underway to develop a ‘Yushu Tourism Network’ that may help set the desired ’standard’ for tourism in the region, which should consider social, cultural and environmental factors as well as economic benefits. Following the earthquake, helping to rebuild and/or develop alternative livelihoods will be of great importance, and with a national focus now on Yushu as a major ecotourism destination, engaging with and supporting local Tibetan communities so that they may truly benefit from such new developments is a key role for us to consider. The final death toll from the 7.1-magnitude earthquake that jolted Yushu of northwest China’s Qinghai Province on April 14 was 2,698, with 270 people missing, vice governor Zhang Guangrong said Monday. Among the victims, 2,687 had been identified and the identities of 11 bodies remained unknown, Zhang told a press conference. The vice governor said the killed include 199 students and a Hong Kong resident. A 5.4 aftershock, the strongest since the initial quakes, was reported around the Yushu/Gyegu area. There are no reported injuries at this time. Our staff took several calls from friends and coworkers in Yushu who all reported that the situation wasn’t serious nor was it hampering relief efforts. This is to be expected since the vast majority of Yushu residents are living in tents outside of town. Reports did come in that the aftershock was much stronger on the west side of town while relief workers on the east side of town still felt the tremor. Our relief efforts continue in Jiegu with provision of necessities for daily living in the tent encampments. Two of our field staff returned to Xining late last night after having distributed durable insulated tents, thermal clothing, cooking implements, and various other materials to make life in the camps more livable. They also assessed the needs for additional relief supplies and services while on site, and will be reporting soon as to what specific supplies need to be sent down over the coming days. We apologize for the lack of updates recently; the fact remains, however, that we are still very much involved in the relief efforts. Disaster relief work in Jiegu/Yushu continues, as so many needs following the earthquake will persist for weeks and months to come. Up to three years may be needed for full reconstruction of the town … and this means that many local residents will have to live in their makeshift tent-homes for at least one winter, and probably two winters, before moving back to a semblance of normality. It is not an easy time, and we will continue to assist people in Yushu in as many ways as possible. Specifically, we are now focusing our relief efforts on three fronts: distribution of emergency supplies, provision of clean water, and (discussions regarding) the possible establishment of a rehabilitation centre somewhere in the prefecture. Relief supplies currently being distributed to needy families in Jiegu include large tents, beds for the elderly, household cooking sets, solar powered lighting, thermal clothing, etc. Additional requests also are being made to assist with provision of fuel for heating and cooking. On-site we are cooperating with government and village leaders, other emergency relief camps, and local families. Regarding water, we are now arranging for a new low-tech (appropriate technology) water purification system to be trialed, which could meet the needs of several households per unit; and we also are in discussion with a large firm about the possible installation of an community-scale water purification system that can provide for over 10,000 people with one unit and could be used in township centers. Rehabilitation needs are equally great and we are therefore also exploring the different ways possible to assist in this area, as we already have on staff, or available, medical personnel well suited to help meet such needs. Continued assistance is needed, however, to help carry out all of the above activities – particularly in the area of on-going financial support. 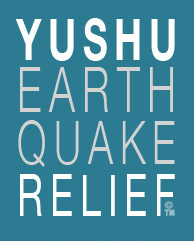 The relief and recovery work following the devastating earthquake that affected Yushu on April 14, 2010, will need to be long-term and your support is enormously appreciated. Over the past week we delivered 28 high-capacity water purification systems to Jiegu. On Tuesday we sent a team with two trucks full of tents for distribution to residents of the town, as well as checking on water purification efforts. They arrived in Jiegu today along with a chemical engineer to start assessing longer-term options for improving access to clean water and two Plateau Perspectives managers to discuss potential for delivery of additional relief supplies.